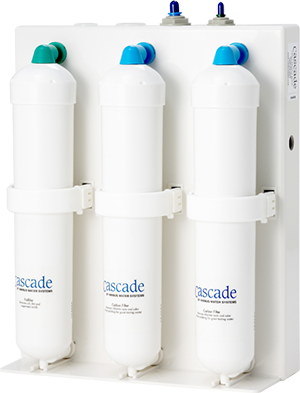 The Cascade filtration drinking water system includes a 20 micron prefilter and two granular activated carbon filters (GAC) to deliver up to 1,700 gallons of clear, clean tasting drinking water. The prefilter removes dirt, rust and other suspended solids and the GAC cartridges remove chlorine taste and odor. The three filter cartridges are hygienically sealed and can be replaced without tools. Shipped with chrome, non-airgap faucet.